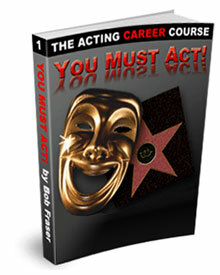 Articles from Bob Fraser's forthcoming book, "Acting FAQ"
Bob Fraser is an actor, writer, producer, director and author of You Must Act! "The Bible of Acting Success"
Bob was born in New York City just before the end of World War Two. His father was a radio personality and his mother was a nurse. After attending the University of Colorado, Bob started his acting career at The Little Theatre On The Square in Sullivan, Illinois. Bob made his New York debut in 1966 in a play called The March March. After five years in New York and roles in dozens of plays, Bob and his wife Bev Wiest purchased what would be the first of the four theatres they have owned and operated. They made the move to Los Angeles in 1976 and Bob started writing. His first writing job was The Love Boat in 1978. Bob is among a handful of people who have acted, written, directed and produced a popular television series - and he's done it twice. First was Benson (1979), starring Robert Guillaume, where for six years Bob was show runner and portrayed the slimy Senator Leonard Tyler. The highlight for Bob was directing Academy Award winning actor George Kennedy in a special one hour murder mystery episode they wrote together. Bob later went on to create, star in, write and executive produce Marblehead Manor (1987) for Paramount and NBC. Bob's career is like that. He's owned theatres, had his own talk show, been a radio DJ, appeared in New York stage productions, and written scores of television and film scripts as well as more than a dozen plays.